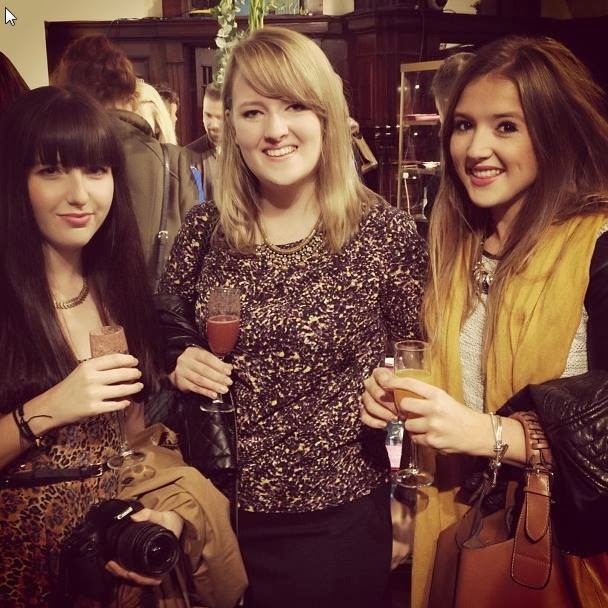 Vogue's Fashion Night Out hit Manchester hard last Thursday. It was the first time the style soiree was brought up north and the city was buzzing all week in anticipation. In my eyes there's two types of female fashionistas in Manchester: you're either wearing high heels or hi-tops. You've got the WAG wannabes who's Mecca is somewhere along Deansgate Locks on a Saturday night and the cliff-hangingly edgy vibes from those who prefer to chill right out in the Northern Quarter. You might think I'm being cynical. I'm not!I think these two styles leave you with a really great blend of grunge glamour, one of the most versatile trends to appear on the catwalk. Our first stop was Vivienne Westwood to have a sneak peak at her collaboration with the Cambridge Satchel Company. Mustard yellow is a firm favourite in my autumn wardrobe and if money was no object me and those double fronted buttons would be inseparable right now. Ok, so I'd probably give the toe-detail heels a miss, but I think an oversized buckle is a nice touch. I went along with Anna from I Live This City, Sarah over at Sequin This and Caroline who's sweet tooth can be found at the Afternoon Tea Club. A big fashion no-no of mine has always been tartan. I don't know why, I've just never thought it a print I could pull off. But it's been all over the high-street lately and I think I've been converted. Classy and cosy at the same time. A few Bellinis later we sauntered over to H&M just in time to listen to Pixie Geldof's DJ set. Toni & Guy were there too but the queue was mental so we left in search of more fashion (and free booze). We turned up at Coast. Despite the shop being empty (what was that about?) the cocktails were flowing freely, so we got stuck in - to choosing wedding dresses, that is. Ahem. Back to reality. I need this chunky hunk of glitz around my neck this Christmas! We perhaps window shopped for a bit too long and sensed the staff getting a bit fidgety so scampered off to Selfridges to join the masses. We soaked up the atmosphere and mooched over to Harvey Nics for one last fashion hit. No pics from here thereon, I think the free booze took its toll. I hope Vogue's Fashion Night Out comes to Manchester again soon. Maybe I'll wear tartan!